This article is about the American football player. For the Australian rules footballer, see Aaron Rogers. After backing up Brett Favre for the first three years of his NFL career, Rodgers became the Packers' starting quarterback in 2008. In 2010 he led them to a victory in Super Bowl XLV over the Pittsburgh Steelers, earning the Super Bowl MVP. He was named Associated Press Athlete of the Year in 2011, and was voted league MVP by the Associated Press for the 2011 and 2014 NFL seasons. Aaron Charles Rodgers was born in Chico, California, the son of Darla Leigh (née Pittman) and Edward Wesley Rodgers. Aaron's father is a Texas-born chiropractor who played football as an offensive lineman for the Chico State Wildcats from 1973 to 1976. His ancestry includes English, Irish and German. The family moved to Ukiah, California, where Aaron attended Oak Manor Elementary School. Edward Rodgers tossed a football with his sons Luke, Aaron and Jordan, and told them not to drink and not to party in college or they would limit themselves in sports like he did. Aaron took this advice to heart. At the age of ten, he was featured on the front page of the Ukiah Daily Journal for his top performance at a local basketball free throw competition. Later, the family moved to Beaverton, Oregon, where Rodgers attended Vose Elementary School and Whitford Middle School, and played baseball in the Raleigh Hills Little League at shortstop, center field and pitcher. The Rodgers family returned to Chico in 1997, and Aaron attended Pleasant Valley High School, starting for two years at quarterback and garnering 4,421 passing yards. He set single-game records of six touchdowns and 440 all-purpose yards. Rodgers set a single-season school record with 2,466 total yards in 2001. He graduated from Pleasant Valley High School in spring 2002. Despite his record-setting high school statistics, Rodgers attracted little interest from Division I programs. In a 2011 interview with E:60, he attributed the relative lack of attention in the recruiting process to his unimposing physical stature as a high school player at 5'10" (1.78 m) and 165 lb (75 kg). Rodgers had wanted to attend Florida State and play under head coach Bobby Bowden, but was rejected. He garnered only an offer to compete for a scholarship as a walk-on from Illinois. He declined the invitation, and considered quitting football to study for law school. Rodgers threw 26 touchdowns in his freshman season at Butte Community College, leading the school to a 10–1 record, the NorCal Conference championship, and a No. 2 national ranking. While there, he was discovered by the California Golden Bears's head coach Jeff Tedford, who was recruiting Butte tight end Garrett Cross. Tedford was surprised to learn that Rodgers had not been recruited earlier. 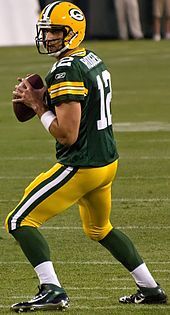 Because of Rodgers's good high school scholastic record, he was eligible to transfer after one year of junior college instead of the typical two. As a junior college transfer, Rodgers had three years of eligibility at Cal. He was named the starting quarterback in the fifth game of the 2003 season, against the only team that offered him a Division I opportunity out of high school, Illinois. As a sophomore, he helped lead the Golden Bears to a 7–3 record as a starter. In his second career start, Rodgers led the team to a 21–7 halftime lead against #3 USC. Due to injury, Rodgers was replaced in the second half by Reggie Robertson. The Bears won in triple overtime, 34–31. Rodgers passed for 394 yards and was named game MVP in the Insight Bowl against Virginia Tech. In 2003, Rodgers tied the school season record for 300-yard games with five and set a school record for the lowest percentage of passes intercepted at 1.43%. As a junior, Rodgers led Cal to a 10–1 record and top-five ranking at the end of the regular season, with their only loss a 23–17 loss at No. 1 USC. In that game, Rodgers set a school record for consecutive completed passes with 26 and tied an NCAA record with 23 consecutive passes completed in one game. He set a Cal single-game record for passing completion percentage of 85.3. Rodgers holds the Cal career record for lowest percentage of passes intercepted at 1.95 percent. Rodgers's performance set up the Golden Bears at first and goal with 1:47 remaining and a chance for the game-winning touchdown. On the first play of USC's goal line stand, Rodgers threw an incomplete pass. This was followed by a second-down sack by Manuel Wright. After a timeout and Rodgers's incomplete pass on third down, USC stopped Cal's run play to win the game. Rodgers commented that it was "frustrating that we couldn't get the job done." Overall, he finished the 2004 season with 2,566 passing yards, 24 touchdowns, and eight interceptions. His 66.1% pass completion percentage led the Pac-10. Before the draft, Rodgers was confident that he would be drafted to the team he supported and grew up near, the San Francisco 49ers, who possessed the No. 1 overall pick in the draft. The 49ers, however, drafted quarterback Alex Smith out of Utah instead, and Rodgers slid all the way down to the 24th overall pick by the Green Bay Packers. Rodgers has said that he experienced much angst and restlessness when waiting to be selected several hours into the draft, as he had expected himself to be selected much sooner. Rodgers's slip to the 24th selection and the Packers choosing to pick Brett Favre's future replacement became one of the biggest stories of the draft, though he was still the second quarterback selected. His drop in the draft was later ranked number one on the NFL Network's Top 10 Draft Day Moments. Many teams drafting between the second and 23rd positions had positional needs more pressing than quarterback. Rodgers was one of five other quarterbacks coached by Jeff Tedford to be drafted in the first round of an NFL draft, joining Trent Dilfer, Akili Smith, David Carr, Joey Harrington, and Kyle Boller. In August 2005, Rodgers agreed to a reported five-year, $7.7 million deal that included $5.4 million in guaranteed money and had the potential to pay him as much as $24.5 million if all incentives and escalators were met. Rodgers spent his rookie season with the 4–12 Packers as the Packers' backup quarterback behind Brett Favre. He received his first extended look in the opening preseason game against the San Diego Chargers after replacing Favre. He had to endure a malfunctioning radio in his helmet and two offensive flags. Once the regular season began, Rodgers saw very little action that year. He played against the New Orleans Saints in the fourth quarter of a 52–3 victory, and completed his first career pass to fullback Vonta Leach for 0 yards. On December 19, 2005, Rodgers entered the game against the Baltimore Ravens at the end of the third quarter in a 48–3 loss. He completed eight of 15 passes for 65 yards and an interception. Rodgers saw one more play at the end of the season against the Seattle Seahawks, taking a knee to end the game. Though Rodgers played very little in his rookie season, he ran the scout team during practice. His job was to mimic opponents' schemes for the defense for the game the following week. Rodgers said this was critical to his success, and that those were his game reps. The defense and scouts often complained that he was practicing too hard, and at one point asked him to tone it down. He stated that he had probably "rubbed people the wrong way" with how hard he practiced. Wide receiver Donald Driver commented that Rodgers took "every scout-team possession like it was the last possession of his life." After the Packers' losing season of Rodgers's rookie year, head coach Mike Sherman was fired and replaced by Mike McCarthy. Rodgers was then placed in McCarthy's "Quarterback school" for six hours a day several times a week. This focused on working on Rodgers's motor skills such as hand-eye coordination, finger dexterity, and mechanics. McCarthy also worked on Rodgers's release point, moving it from right beside the ear hole of his helmet to further below it, to give him a smoother release. Rodgers was also instructed to lower his body fat ratio from 15 percent to 12 percent. Rodgers was resistant to the changes at first but later commented that he thought they were for the better. During practice in 11-on-11 drills, Rodgers completed 62.7% of his passes with seven interceptions, and McCarthy commented that "He's getting better" and that "You're looking at a guy who's going to mature. He's got athletic ability that people still haven't seen." Rodgers saw very little action during the 2006 season, but did step in on October 2 when Favre left the game due to injury. Rodgers completed two out of three passes for 13 yards. On November 19, 2006, Rodgers broke his left foot while playing against the New England Patriots in a 35–0 defeat at home, filling in for an injured Brett Favre, and Rodgers missed the remainder of the 2006 season. Rodgers made a full recovery and was ready for the start of the 2007 season. With then quarterbacks' coach Tom Clements, Rodgers reviewed every play from the previous season, learning to read defensive coverages and to throw receivers open. Rodgers also took the spring practice reps with the Packers' first team. However, weeks after an emotional interview with NBC's Andrea Kremer, following the team's season-ending victory at Chicago, Favre announced that he would stay with the Packers for the 2007 season, again postponing Rodgers's hopes of becoming the Packers' starting quarterback. Prior to the 2007 season, rumors surfaced about a potential trade involving Rodgers in which he would be traded to the Oakland Raiders for wide receiver Randy Moss. However, Moss was traded to the New England Patriots during the second day of the 2007 NFL Draft, and Rodgers stayed in Green Bay. Brett Favre's retirement announcement on March 4, 2008, opened up the Packers' starting quarterback position to Rodgers for the 2008 season. Although Favre decided to return from retirement, he was traded to the New York Jets, which meant that Rodgers would become the starter. Rodgers quickly proved that he was one of the best quarterbacks in the league by passing for 4,038 yards in his first season as a starter as well as throwing for 28 touchdowns and only 13 interceptions, which remains his career high as of the 2017 season. With Rodgers making his debut as a starter, the Packers beat the Minnesota Vikings 24–19 at Lambeau Field. This marked the first time since 1992 that a quarterback other than Favre started a regular-season game for the Packers. Rodgers ended the game with 178 yards passing and two touchdowns (one passing and one rushing). In just his second NFL start the following week, Rodgers was voted the FedEx Air award winner after passing for 328 yards and three touchdowns in a win against the Detroit Lions. During the fourth week of the season, Rodgers's streak of 157 consecutive pass attempts without an interception ended when he was intercepted by Derrick Brooks of the Tampa Bay Buccaneers. The streak was the third-longest in franchise history behind Bart Starr (294) and Brett Favre (163). Rodgers suffered a severe shoulder sprain in the game but continued to start and played well in a win against the Seattle Seahawks two weeks later, which to many proved his toughness. [additional citation(s) needed] Despite early successes, Rodgers had been unable to win a close game during the season despite seven opportunities to do so. On October 31, 2008, Rodgers signed a six-year, $65 million contract extension through the 2014 season. In Rodgers's first full season with the team, the Packers finished with a 6–10 record and missed the playoffs. For the opening game of the 2009 season, Rodgers recorded his first win in a comeback situation. The Packers were trailing at the beginning of the fourth quarter when Rodgers completed a fifty-yard touchdown pass to wide receiver Greg Jennings with about a minute remaining in the game to contribute to the 21–15 victory over the Chicago Bears. 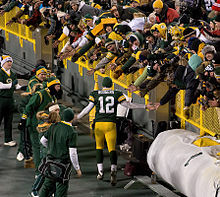 Rodgers was named NFC Offensive Player of the Month for October 2009, when he passed for 988 yards, completed 74.5 percent of his passes, and recorded a passer rating over 110 for all three games played during the month. After a 4–4 start to the season and a loss to the previously winless Tampa Bay Buccaneers, the team began to heat up. Rodgers led the Packers to five straight wins, in which he threw for a total of 1,324 yards, 9 touchdowns, and only 2 interceptions. Rodgers and the Packers won two of their last three games, finishing the second half of the season with a 7–1 record and an overall 11–5 record; good enough to secure a wild card playoff berth and clinch the fifth seed in the playoffs. The Packers set a new franchise record by scoring 461 total points (third in the league), breaking the previous record held by the 1996 Super Bowl team (456). Rodgers also made the record books, becoming the first quarterback in NFL history ever to throw for 4,000 yards in both of his first two years as a starter. He finished the season fourth in passing yards (4,434), touchdown passes (30), passer rating (103.2), and yards per attempt (8.2) as well as eighth in completion percentage (64.7%), while also coming second among quarterbacks in rushing yards (316). His passing yardage made him second all-time in Packers history, behind only Lynn Dickey's all-time single-season record. His passer rating of 103.2 was also third-highest in team history at the time, behind only Bart Starr's 105.0 rating in 1966 and 104.3 rating in 1968 (minimum 150 attempts). In the Wild Card Round, the Packers played the Arizona Cardinals, the same team they had previously beaten the week before, 33–7. Rodgers and Cardinals quarterback Kurt Warner put on a show that later ranked second on NFL Network's Top 10 Quarterback Duels. Rodgers's first pass was intercepted by Dominique Rodgers-Cromartie. Rodgers settled down after that miscue, however, and finished the game completing 28 of 42 passes for 423 yards, with four touchdown passes all in a second-half comeback. His 423 passing yards are the most by any quarterback in his first playoff game as well as his four touchdown passes and 5 total touchdowns. Kurt Warner shredded the Packers' second-ranked defense, completing 29 of 33 passes for 379 yards, 5 touchdowns, no interceptions, and a passer rating of 154.1. Despite Rodgers's offensive efforts, the Packers lost the game when he fumbled on a controversial play in overtime. The ball was returned by Karlos Dansby for the winning touchdown in the 51–45 Cardinals victory. It was the highest scoring playoff game in NFL history. Due to his regular-season performance, Rodgers earned a trip to his first Pro Bowl as the NFC's third quarterback, behind Drew Brees and Brett Favre. However, after Favre dropped out due to injury and Brees was replaced due to his participation in Super Bowl XLIV, Rodgers became the NFC's starter. He finished the day with 15 of 19 passing, 197 yards and two touchdowns. In 2010, Rodgers led the Packers to a 2–0 start, but then lost three of their next four games, including back-to-back overtime losses. The two overtime defeats brought Rodgers's record in overtime games to 0–5. At midseason, Rodgers had already thrown nine interceptions compared to only throwing seven all of the previous season, and was 16th in the league with an 85.3 passer rating. Over the remainder of the regular season, however, his play improved as he threw 16 touchdowns to only two interceptions, completed 71.4% of his passes, and had a passer rating of 122.0. In Week 13, in a 34–16 victory over the San Francisco 49ers, Rodgers had 298 passing yards and three touchdowns to earn his first career NFC Offensive Player of the Week honor. In Week 14, he sustained his second concussion of the season. Backup Matt Flynn was put into the game as Rodgers' replacement. The Packers lost the game 7–3 to the Detroit Lions. Against the New England Patriots, Rodgers missed the next week's regular season start, ending his streak of consecutive starts at 45, which is tied for the second longest in team history. After their road loss to the Patriots, the Packers found themselves at 8–6 and had to win their final two regular season games to qualify for the playoffs. Rodgers turned around the team's performance; they won their final two regular season games, one of them against the New York Giants, where Rodgers completed 25 of 37 passes for 404 yards, with four touchdown passes, and with a passer rating of 139.9. It was his first regular season 400 yard passing game. For his effort against the Giants, he earned his second NFC Offensive Player of the Week honor for the 2010 season. They then defeated the Chicago Bears by a score of 10–3 in the season finale. 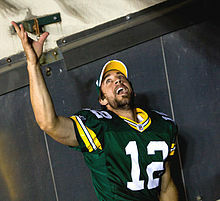 Rodgers was named the FedEx Air NFL Player of the Year for his passing performance in the 2010 season. With a 10–6 record, the Packers entered the playoffs as a wildcard and the No. 6 seed. In the Wild Card Round, they defeated the No. 3 seeded Philadelphia Eagles 21–16. In the Divisional Round, Rodgers completed 31 of 36 pass attempts for 366 yards and four touchdowns in a 48–21 blowout victory over the No. 1 seeded Atlanta Falcons. It was the most points scored in Packers postseason history. During the contest, Rodgers tied an NFL record for consecutive playoff games with at least three touchdown passes (3 games). Rodgers also set an NFL record by becoming the only quarterback to pass for ten touchdowns combined through three consecutive playoff games. On January 23, 2011, Rodgers had a 55.4 passer rating as the Packers beat the No. 2 seed Chicago Bears 21–14 win to capture the NFC Championship. After winning the NFC championship game, the Packers earned a trip to Super Bowl XLV—a game in which they won, 31–25, against the Pittsburgh Steelers. In the game, Rodgers completed 24 of 39 pass attempts for 304 yards and three touchdowns in the win, and was named Super Bowl MVP for his performance. From his playoff performance, Rodgers became only the third player in NFL history to pass for over 1,000 yards in a single postseason and also became one of only four quarterbacks to record over 300 yards passing, with at least 3 touchdown passes, and no interceptions in a Super Bowl. He finished with 1,094 passing yards (fourth most all time), 9 touchdown passes (tied for fourth most all time), 2 rushing touchdowns, and 2 interceptions, while completing 68.2% of his passes for a passer rating of 109.8. From this postseason, Rodgers also became the only player to pass for at least 900 yards and rush for at least 2 touchdowns in a single postseason. He was ranked 11th by his fellow players on the NFL Top 100 Players of 2011. Because of the 2011 NFL lockout, the Packers and Rodgers didn't schedule unofficial offseason workouts, despite many teams doing so. Rodgers and the Packers quickly quelled any concerns over their readiness by defeating the New Orleans Saints, who had scheduled offseason workouts, 42–34. He had 312 passing yards and three touchdowns to earn NFC Offensive Player of the Week. After the game, Rodgers said in the press conference, "I was going to ask myself, what would have happened if we had offseason workouts? I mean, could we have started any faster and scored more points tonight?" In Week 4, a 49–23 victory over the Denver Broncos, Rodgers had 408 passing yards, four touchdowns, and one interception to earn another NFC Offensive Player of the Week honor. In Week 6, a 24–3 victory over the St. Louis Rams, Rodgers converted on a career-high 93-yard touchdown pass to Jordy Nelson. In Week 9, a 45–38 victory over the San Diego Chargers, he had 247 passing yards and four touchdowns to earn his third NFC Offensive Player of the Week honor for the 2011 season. Rodgers and the Packers got off to a 13–0 start in 2011, tying the NFC record for most consecutive wins to start a season, but were upset by the Kansas City Chiefs 19–14 in week 15, ending their winning streak at 19 games, the second-longest winning streak in NFL history. Rodgers finished the season with 4,643 passing yards, 45 touchdown passes, and six interceptions, good for a passer rating of 122.5, which as of 2018[update] is the highest single-season passer rating in NFL history. In addition to passer rating, Rodgers led the league in touchdown to interception ratio (7.5, fourth best all-time), touchdowns passing % (9.0%, second highest all-time), and yards per attempt (9.2, fourth highest all-time since becoming an official stat in 1970), while finishing second in both touchdown passes (45, sixth-highest all-time) and completion percentage (68.3%), as well as fifth in passing yards. He earned NFC Offensive Player of the Month awards for September, October, and November, and FedEx Air Player of the Week six times (Weeks 4, 5, 6, 7, 9, and 13). In week four against the Denver Broncos, Rodgers became the only quarterback in NFL history to record over 400 passing yards with four touchdown passes, while also rushing for two touchdowns in the same game. He was the winner of the 2011 Galloping Gobbler as MVP of the Thanksgiving game between the Packers and the Detroit Lions, a 27–15 Green Bay victory, and tied an NFL record for consecutive games with at least two touchdown passes (13). The Packers became the fifth team in NFL history to finish the regular season with a 15–1 record. Rodgers played in 15 of the 16 games, with the only exception being Week 17 against the Detroit Lions, a game in which Rodgers was rested after the club clinched home-field advantage for the playoffs the previous week. The Packers' offense set franchise record for points scored in a season with 560, which as of 2016[update] is the third-most ever behind only the 2007 Patriots and 2013 Broncos. Rodgers set numerous NFL records in 2011. He recorded a passer rating of over 100.0 in thirteen games during the season, including twelve games in a row (both records), and a passer rating of 110.0 or higher in twelve games, including eleven in a row (also records). Rodgers also won the league's MVP award, receiving 48 of the 50 votes (the other two going to Drew Brees). He also finished second, behind Brees, for the AP Offensive Player of the Year award. 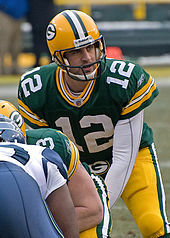 Rodgers's 2011 season was later ranked as the third greatest passing season of all time by ESPN in 2013, and was regarded as the most efficient. The Packers were upset by the eventual Super Bowl champion New York Giants in the Divisional Round the score of 37–20. The Packers' receiving corps dropped six passes in the loss and Rodgers finished the game with 264 passing yards, two touchdown passes, and an interception on his last pass attempt. 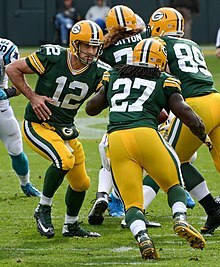 The 2011 Packers became the only team in NFL history to go 15–1 and not win a playoff game, as well as being the fourth consecutive team to win at least 15 games and not win the Super Bowl. He was named to the Pro Bowl for his 2011 season to go along with a First Team All-Pro honor. He was voted by his fellow players as the best player in the league on the NFL Top 100 Players of 2012. Rodgers and the Packers started off the 2012 season with a 30–22 loss to the San Francisco 49ers. With the loss, Rodgers lost his bet with the music group Boyz II Men, and had to wear an Alex Smith jersey during the next week of practice. Had the Packers won the game, Boyz II Men would have sung the national anthem during their next home game at Lambeau. In Week 4, a 28–27 victory over the New Orleans Saints, Rodgers had 319 passing yards, four touchdowns, and one interception to earn NFC Offensive Player of the Week. In Week 6 against the undefeated Houston Texans, he tied the franchise record by throwing six touchdown passes, in a 42–24 victory, to earn NFC Offensive Player of the Week. The Texans had allowed only six total touchdowns passes during the season up to that point. This sparked a five-game winning streak which Rodgers completed 65.7% of his passes for 1,320 yards, 17 touchdowns, two interceptions, and a passer rating of 119.1. In Week 15, Rodgers threw for 291 yards and three touchdowns to lead the Packers past the Chicago Bears, 21–13, making them NFC North champions for the second consecutive year. In the season finale, despite Rodgers going 28 of 40 for 365 yards, four touchdowns, no interceptions and a passer rating of 131.8, the Packers lost 37–34 against the Minnesota Vikings. This ended the Packers' twelve-game winning streak against NFC North opponents. The Packers finished with an 11–5 record, first in the NFC North, and clinched the #3-seed in the NFC playoffs. Rodgers led the league for the second straight year in passer rating (108.0) touchdowns passing % (7.1%), and touchdown-to-interception ratio (4.875), while finishing second in touchdown passes (39), third in completion percentage (67.2%), fifth in yards per attempt (7.78), and eighth in passing yards (4,295). In the playoffs, the Packers defeated the Minnesota Vikings 24–10 in the Wild Card Round. Rodgers completed 23 of 33 passes to ten different players for 274 yards and a touchdown. They were beaten 45–31 by the San Francisco 49ers in the Divisional Round. Rodgers completed 26 of 39 passes for 257 yards, two touchdowns, and an interception, while also rushing for 28 yards, in the losing effort. He earned his third career Pro Bowl nomination for his performance in the 2012 season. He was voted #6 by his peers on the NFL Top 100 Players of 2013. On April 26, 2013, the Packers and Rodgers agreed to a 5-year, $110 million contract extension making him the highest paid player in NFL history. The Packers began their 2013 season against the reigning NFC champions, the San Francisco 49ers, the team that also ended their playoff run the previous season. Rodgers went 21 for 37 in completions, 333 yards, three touchdowns and an interception in the 34–28 loss. The following week, Rodgers had a career-high 480 passing yards to tie the franchise record in the 38–20 home-opener win against the Washington Redskins. He earned NFC Offensive Player of the Week for his effort against the Redskins. His 335 passing yards in the first half set a club record. He also became the first quarterback since Y. A. Tittle in 1962 to throw for at least 480 yards, four touchdowns and no interceptions in a game. For his performance he was named NFC Offensive Player of the Week for Week 2. The following week, Rodgers saw his NFL record of 41 consecutive games without throwing multiple interceptions come to an end in a loss to the Cincinnati Bengals by the score of 34–30. After the loss to the Bengals, the Packers started rolling, winning their next four games. Against the Baltimore Ravens, the Packers lost two receivers: Randall Cobb and James Jones. Cobb was sidelined with a broken leg and Jones with a sprained PCL. Against the Cleveland Browns, tight end Jermichael Finley was carted off the field with a bruised spinal cord, leaving Rodgers without three of his top four offensive weapons. The next week against the Minnesota Vikings, Rodgers completed 24 of 29 passes in a 44–31 victory. At home against the Chicago Bears in Week 9, Rodgers was sacked by Shea McClellin. He fractured his left clavicle in the process, and the speculation for his return ranged from a few weeks to an indefinite timetable that became a weekly spectacle of whether or not or when he might be cleared to play again. Before Rodgers had broken his collarbone, the Packers had won four straight games to climb to the top of the NFC North division with a 5–2 record. With Rodgers injured and unable to play, the Packers went winless over the next five weeks to fall to 5–6–1 on the season. After rallying in December behind re-acquired backup quarterback Matt Flynn, the Packers had fought their way back to a 7–7–1 record going into the final week of the season. On Thursday, December 26, Packers head coach Mike McCarthy announced Rodgers would return and start in the season-finale showdown against the Chicago Bears at Soldier Field for the NFC North championship. Returning from the injury, Rodgers threw for 318 yards, two touchdowns, and two interceptions in the regular season finale against the Bears. Trailing 27–28 with under a minute to go in the game and facing the third 4th down of the drive, a 4th & 8 from the 48 yard line, Rodgers connected with Randall Cobb (also returning for his first game since breaking his leg in Week 6) for a 48-yard game-winning touchdown to clinch the North Division championship and earn the right to host a home playoff game against the San Francisco 49ers. Rodgers won the 2013 GMC Never Say Never Award for the come-from-behind, division winning touchdown pass. Rodgers finished fifth in the league in passer rating (104.9), completion percentage (66.6%), and yards per game (282) while also finishing second in yards per attempt (8.75). Rodgers led the Packers to the playoffs again, this time with an 8–7–1 record and were up against the team that eliminated them last year in the Divisional Round of the playoffs, the San Francisco 49ers. The Packers lost to the 49ers for the fourth consecutive time, 23–20 on a last second field goal at Lambeau Field, in the Wild Card Round. Rodgers recorded only 177 yards passing, his lowest in a playoff game, and one touchdown pass. He was ranked #11 by his fellow players on the NFL Top 100 Players of 2014. After their loss to the Lions, the Packers went on a four-game win streak, during which, Rodgers threw 13 touchdowns with no interceptions. In Week 4, a 38–17 victory over the Chicago Bears, he had 302 passing yards and four touchdowns to earn NFC Offensive Player of the Week. In Week 6 against the Miami Dolphins, Rodgers led the Packers to a game-winning drive with less than two minutes remaining. He completed a 4th & 10 pass to wide receiver Jordy Nelson and mimicked Dan Marino's famous fake spike play by completing a pass to wide receiver Davante Adams to get to within four yards of the endzone later in the drive. Rodgers then completed a touchdown pass to tight end Andrew Quarless to win the game 27–24. This play would later win Rodgers the GMC Never Say Never Moment of the Year Award. In Week 7, a 38–17 victory over the Carolina Panthers, he had 255 passing yards and three touchdowns to earn NFC Offensive Player of the Week. In a Week 8 loss against the New Orleans Saints, Rodgers finished 28 of 39 for 418, with one touchdown pass and two interceptions, ending his 212 consecutive attempts without an interception streak—the second longest in team history. In the game, Rodgers injured his hamstring which appeared to have an effect on his play for the remainder of the game. In Week 10 against the Chicago Bears, Rodgers became the second player in NFL history and the first since Daryle Lamonica in 1969 to throw six touchdown passes in the first half. Rodgers finished 18 of 27 for 315 yards and six touchdowns despite only playing one drive in the second half to earn NFC Offensive Player of the Week. Rodgers set multiple records during the game: most touchdown passes of 70 or more yards with 16—breaking the record held by Brett Favre and Peyton Manning, most consecutive touchdown passes without an interception at home—breaking the record also held by Favre and Manning, and became the first quarterback to ever have 10 touchdown passes against the same team in a season. In a Week 11 game against the 7–2 Philadelphia Eagles, Rodgers set a record for most consecutive attempts at home without an interception, breaking Tom Brady's record of 288 consecutive attempts. In the 53–20 victory, he finished going 22 of 36, with 341 passing yards, three touchdown passes and no interceptions. The 8–3 Packers met the 9–2 New England Patriots in Week 13 at Lambeau Field in what was Tom Brady and Rodgers' first time playing against each other as starters. Rodgers finished going 24 of 38, with 368 passing yards and two passing touchdowns in the 26–21 Packers victory. In the Week 17 game against the Detroit Lions, Rodgers re-injured his left calf while extending a play and throwing a touchdown pass to Randall Cobb then was helped off the field, and carted off to the locker room. After missing a series, Rodgers re-entered the game with the scored tied 14–14. Despite being less mobile with the injury, Rodgers completed 13 of 15 passes for 129 yards and two scores against the league's second-ranked defense. The Packers won 30–20, winning their fourth straight NFC North title. Rodgers finished 17 of 22 for 226 yards, two touchdown passes, no interceptions, a 139.6 passer rating, and a rushing touchdown to earn his fourth NFC Offensive Player of the Week honor for the 2014 season. The Packers secured the second seed in the NFC, rewarding them with a playoff bye and a week off which helped Rodgers rest and rehabilitate his injured left calf. In the Divisional Round, the Packers were scheduled to play the 13–4 Dallas Cowboys, which marked the first time in NFL playoff history when a team which went undefeated at home (Packers) played against a team which went undefeated away (Cowboys). Rodgers helped secure a 26–21 victory by finishing 24 of 35 for 316 yards, three touchdowns, no interceptions, and a 125.4 passer rating. The Packers then traveled to Seattle to face the top-seeded Seahawks in a rematch of the regular season opener. In the NFC Championship, the Packers were leading 19–7 with just over five minutes to go, but the home team's offense finally woke up and, with the assistance of a crucial Packers special teams gaffe on an onside kick, the Seahawks led 22–19, with 44 seconds remaining. Rodgers quickly drove downfield to set up a tying field goal, only to watch from the sidelines as the Seahawks won the coin toss in overtime and proceeded to score the game-winning touchdown on their first possession. Rodgers was 19-for-34 for 178 yards and a touchdown, with two interceptions in the losing effort. 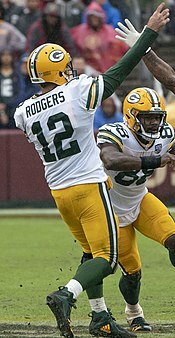 Rodgers finished the regular season first in touchdown-to-interception ratio (7.6), lowest interception percentage (1.0%), second in passer rating (112.2), yards per attempt (8.4), and touchdown passing percentage (7.1%), third in touchdown passes (38), seventh in passing yards (4,381), and ninth in completion percentage (65.6%). He set an NFL record for most consecutive pass attempts (512) at home without an interception, and touchdown passes (41). Rodgers was voted the AP NFL Most Valuable Player for the 2014 season, receiving 31 votes, and was named NFC Offensive Player of the Year by the Kansas City Committee of 101 and Fed-Ex Air NFL Player of the Year. He was also named to the AP All-Pro team as the first quarterback, receiving 44 votes while runner-up Tony Romo received three. He was named to the Pro Bowl for the 2014 season. He was ranked as the second best player in the league among his fellow players on the NFL Top 100 Players of 2015. In 2015, Rodgers had a down-year by his standards. He threw for a career low 3,821 yards in which he played for at least 15 games, although he had 31 touchdowns to just 8 interceptions. Rodgers completed only 60.7 of his passes, averaged only 6.7 yards per attempt and finished with a passer rating of 92.7; all career lows. Pro Bowl wide receiver, Jordy Nelson's absence due to injury for the season was considered a contributing factor in Rodgers's statistical drop compared to previous seasons. In Week 3, a 38–28 victory over the Kansas City Chiefs, Rodgers had 333 passing yards and five touchdowns to earn NFC Offensive Player of the Week. During Week 9 against the Carolina Panthers, he finished with 369 passing yards, 4 touchdowns, and an interception. The interception came with only 1:47 left in the 4th quarter, and following the interception, Rodgers expressed frustration by throwing down a Microsoft Surface tablet. The Packers ended up losing the game 29–37. On December 3, 2015, in a Week 13 match-up against the Detroit Lions, Rodgers threw a Hail Mary pass caught by Richard Rodgers for 61 yards with 0:00 left to beat the Lions 27–23, after the game was extended due to a facemask penalty called on Detroit. The play was quickly dubbed as "The Miracle in Motown." The Packers made the playoffs as the fifth seed in the NFC with a 10–6 record. They defeated the Washington Redskins 35–18 on the road in the Wild Card Round of the playoffs. Rodgers finished the game with 210 yards and two passing touchdowns. In the Divisional Round against the Arizona Cardinals, Rodgers threw a 41-yard Hail Mary touchdown pass to Jeff Janis as time expired to send the game into overtime. However, the Packers lost 26–20 in overtime. Rodgers finished the game 24 for 44 for 261 yards with a pair of touchdowns and an interception. He was named to his fifth Pro Bowl and was ranked as the sixth best player on the NFL Top 100 Players of 2016. Throughout the first five games of the 2016 season, Rodgers's struggles from the 2015 season appeared to continue. Through those games, he completed 60.2% of his passes, averaged 6.5 yards per attempt, and posted a passer rating of 88.4—all of which are similar to his 2015 numbers. He also fumbled five times, and lost two. His lackluster performance through those games caused much speculation about the causes of his problems. In a Week 7 Thursday Night Football game against the Chicago Bears, Rodgers rebounded by recording a team-high 39 completions, breaking Brett Favre's previous record of 36 in 1993, also against the Bears. Rodgers also amassed his first 300-yard passing game since Week 10 of 2015 in the 26–10 win. The following week against the Atlanta Falcons, Rodgers recorded a career regular-season high of 60 rushing yards, and finished with four touchdown passes and a 125.5 passer rating. After a Week 11 loss to the Washington Redskins—the Packers' fourth in a row, putting them at 4–6—Rodgers was optimistic about the remainder of the season, saying, "I feel like we can run the table, I really do." Despite widespread doubt over the likelihood of such a run, the Packers would go on to finish the season with six straight wins—as Rodgers said they could. In a Week 12 Monday Night Football game Rodgers appeared to injure his hamstring on a scrambling play against the Philadelphia Eagles. After the play, Rodgers went into an injury tent on the sideline to get his leg taped up. Rodgers, however, did not miss any snaps in the game and finished 30 out of 39 for 313 yards with no sacks or interceptions. His 300-yard performance was his fourth of the season and the first allowed by the Eagles' defense all season. The Packers won, 27–13, snapping their four-game losing streak. In a 38–10 victory over the Seattle Seahawks in a Week 14 game, Rodgers and the Packers continued their recent offensive and defensive success. Rodgers finished with 246 passing yards, three touchdown passes and a 150.8 passer rating. The 150.8 passer rating was the best recorded against Seattle's defense since head coach Pete Carroll took over in 2010. Rodgers did this despite suffering a calf injury early in the game. He was named NFC Offensive Player of the Week for his performance against the Seahawks. On December 20, 2016, Rodgers was selected to his third consecutive Pro Bowl and his sixth total. During Week 16, Rodgers and Drew Brees tied the NFL record for most seasons with at least 35 touchdown passes with four—a record shared with Peyton Manning and Tom Brady. In the game against the Minnesota Vikings, Rodgers finished 28 of 38 for 347 yards, four touchdown passes and a rushing touchdown to earn NFC Offensive Player of the Week. His 300-yard performance was the first allowed by the Vikings' defense all season. He also set Packer regular season records for most 4,000-yard passing seasons (6), most completions in a season (374), and—with Jordy Nelson—most touchdowns by a quarterback/wide receiver combination with (59). Rodgers helped lead the Packers to a NFC North title and a playoff berth in 2016. The Packers defeated the New York Giants in the Wild Card Round. Rodgers completed 25 of 40 passes for 364 yards and four touchdowns in the victory. They defeated the #1-seed Dallas Cowboys in the Divisional Round. Rodgers completed 28 of 43 passes for 355 yards, two touchdowns and an interception in the victory. The Packers lost to the Atlanta Falcons in the NFC Championship in the final game at the Georgia Dome. Rodgers completed 27 of his 45 passing attempts for 287 yards with three touchdowns and an interception in the losing effort. In 2016, Rodgers finished with 401 completions and 610 attempts (both career highs), a 65.7% completion percentage, 4,428 passing yards, 40 touchdown passes, seven interceptions, a passer rating of 104.2, 369 rushing yards (career-high), and four rushing touchdowns. With his 40 touchdown passes, he led the league in the statistic for the first time in his career and became one of only four quarterbacks to pass for at least 40 touchdowns in multiple seasons. Rodgers also finished fourth in passing yards, completions, attempts, and passer rating. Amongst quarterbacks, he finished third in rushing yards and fifth in rushing touchdowns. He was ranked sixth by his peers on the NFL Top 100 Players of 2017. In a Week 1 win (17–9) against the Seattle Seahawks, Rodgers had his 50th career game with at least 300 passing yards. He finished the game with 311, but his streak of 251 consecutive passes without an interception came to an end when defensive tackle Nazair Jones picked him off in the first quarter. In the next game, a 34–23 loss to the Atlanta Falcons in Week 2, he had 343 passing yards, two touchdowns, and an interception in the first game in the new Mercedes-Benz Stadium in Atlanta. In Week 5, down by 28–31 against the Dallas Cowboys with less than two minutes on the clock, Rodgers led a nine-play, 75-yard touchdown drive in the 35–31 victory over Dallas, earning him NFC Offensive Player of the Week. During Week 6 against the Minnesota Vikings, Rodgers was taken off the field by his coaches and medical personnel after suffering a shoulder injury on a hit from Anthony Barr. Shortly thereafter, it was revealed that Rodgers suffered a fractured right collarbone. The next day, on October 16, it was announced that Rodgers would have surgery on his broken collarbone. On October 19, he underwent surgery on his collarbone, and was officially placed on injured reserve the next day. A total of 13 screws were inserted to stabilize his collarbone. Rodgers returned to practice on December 2, 2017, making him eligible to play in the upcoming Week 15 game. On December 12, 2017, it was announced that Rodgers was medically cleared by doctors and was set to start the next game against the Carolina Panthers. He was officially activated on December 16, 2017. Rodgers returned during Week 15 against the Panthers, where he finished with 290 passing yards, 3 touchdowns, and 3 interceptions as the Packers lost 24–31. However, two days later, on December 19, Rodgers was placed back on injured reserve after the Packers were eliminated from playoff contention. He was ranked #10 by his fellow players on the NFL Top 100 Players of 2018. On August 29, 2018, Rodgers signed a four-year extension with the Packers worth $134 million featuring a $57.5 million signing bonus. During Sunday Night Football against the Chicago Bears in Week 1, Rodgers left the game with a knee injury but returned in the third quarter. Down by 20 points, Rodgers finished with 286 passing yards and three touchdowns, leading the Packers rally to a 24–23 win. Despite a nagging knee injury, Rodgers had at least 40 pass attempts in each of the next three games. In the last of these, he threw his first interception in 150 attempts. In Week 5, Rodgers passed for 442 yards (the second-best of his career) and three touchdowns, but also two fumbles, in a 31–23 loss to the Detroit Lions. In the following game, a 33–30 victory over the San Francisco 49ers, he had 425 passing yards and two passing touchdowns. Following the bye-week, despite a continuing knee injury Rodgers had his third consecutive week with a 100+ quarterback rating, which included 286 yards passing, no interceptions, and a go-ahead 40-yard touchdown pass to Marquez Valdes-Scantling in a 29–27 loss to the Los Angeles Rams. In Week 13 against the Atlanta Falcons, Rodgers set an NFL record by converting his 359th consecutive pass without an interception, breaking Tom Brady's previous record. In Week 15 against the Chicago Bears, Rodgers threw for 274 yards and an interception in a 24–17 loss. Rodgers's record streak without an interception ended with 402 pass attempts after he was intercepted by free safety Eddie Jackson. During Week 16 against the New York Jets, Rodgers finished with 442 passing yards, two passing touchdowns, and two rushing touchdowns. Trailing at one point by 15 points, Rodgers and the Packers won 44–38 in overtime. He matched his own feat of achieving at least 400 passing yards, two passing touchdowns, and two rushing touchdowns in a single game. The only other time in NFL history that occurred was when Rodgers accomplished it in 2011 against the Denver Broncos. On December 18, 2018, Rodgers was named to his seventh Pro Bowl. In the regular season finale against the Detroit Lions, Rodgers suffered a concussion early in the game and would not return. He was then sent to the hospital to test for concussion symptoms. Because the Packers had already been eliminated from playoff contention, Rodgers answered questions about whether he should be playing, for fear of injury, by saying: "That's just not the way I lead, and I'm super-competitive, and I want to be out there with the guys and I look forward to being out there." Rodgers was later spotted at the Packers' facility after the game. Rodgers finished the season with 372 completions, 597 attempts, 4,442 passing yards, 25 passing touchdowns, two interceptions and a passer rating of 97.6. His touchdown to interception ratio of 25:2 (12.5) ranks third best all-time (min 300 attempts). In addition to setting the record for consecutive passes without an interception during the season, Rodgers also set an NFL record for interception percentage for a season, with only 0.335 % of his passes being intercepted. Most consecutive games without throwing multiple interceptions (41). 21,332 passing yards from 2008 to 2012, the most by a QB in his first five seasons as a starter. Third-most touchdown passes of 70+ yards (16) (Trails Eli Manning and Drew Brees). Most seasons with a passer rating over 100.0 (8). Most seasons with an interception percentage below 1.5% (6). One of only three quarterbacks to have a passer rating of at least 110 in multiple seasons. One of four quarterbacks to pass for 40 touchdowns in multiple seasons. One of four quarterbacks to pass for at least 35 touchdowns in four seasons. Highest touchdown passing percentage (6.4%) in the Super Bowl Era. Only QB with a touchdown passing percentage above 6.0% in the Super Bowl Era. Most games with a passer rating over 95.0 (14) in a season (2011). Most games with a passer rating over 100.0 (13) in a season (2011). Most games with a passer rating over 110.0 (12) in a season (2011). Most games with a passer rating over 115.0 (10) in a season (2011). Most games with a passer rating over 130.0 (6) in a season (2011). Most games with a passer rating over 140.0 (4) in a season (2011). Most consecutive games with a passer rating over 95.0 (13) in a season (2011). Most consecutive games with a passer rating over 100.0 (12) in a season (2011). Most consecutive games with a passer rating over 110.0 (11) in a season (2011). Most games with 200+ passing yards and no interceptions in a season (11) (2014). Most games with 2+ touchdown passes and no interceptions in a season (11) (2014). Most games with 3+ touchdown passes and no interceptions in a season (8) (2014). 6th most touchdown passes in a season (45) (2011). 4th most total touchdowns in a season (48: 45 passing, 3 rushing) (2011). 6th most passing yards in a postseason (1,094) (2010). 5th most touchdown passes in a postseason (9) (2010). 2nd lowest interception percentage (1.1%) with at least pass 600 attempts (2016). 2nd lowest interception percentage (0.96%) with at least 500 pass attempts (2014). 2nd highest touchdown pass percentage (9.0%) in a season with at least 450 pass attempts (2011). 2nd highest yards per attempt average in a season with at least 500 pass attempts (9.25) (2011). Highest touchdown-to-interception ratio (7.6) with at least 500 pass attempts (2014). Most touchdown passes in a half (6). Only player to pass for over 400 yards while throwing four touchdown passes and running for two in one game. Most touchdown passes by a quarterback in his first three playoff games (10). Second-most consecutive playoff games with at least three touchdown passes (3). Most passing yards (423), touchdown passes (4) and total touchdowns (5) by a QB in his first playoff game. One of only five quarterbacks to pass for over 300 yards, with 3 touchdown passes and no interceptions in a Super Bowl. Highest passer rating at home in a season (133.2) (2014). Best touchdown-to-interception ratio at home in a season (25:0) (2014). Second-most consecutive games with at least 3 touchdown passes and no interceptions (4) (2014). Highest completion percentage (86.1%) in a playoff game with a minimum of 35 pass attempts. The Wisconsin Legislature approved a proposal that declared December 12, 2012 (stylized as 12/12/12) "Aaron Rodgers Day" in honor of Rodgers whose jersey number in the NFL is 12. Rodgers currently resides in Suamico, Wisconsin, a northern suburb of Green Bay roughly 10 miles from Lambeau Field. He also owns a home in the affluent beach community Del Mar, California, 20 miles north of downtown San Diego, and lives in Los Angeles during the offseason. He has two brothers; the younger, Jordan, played quarterback at Vanderbilt University, briefly spent time with the Jacksonville Jaguars and later with the Tampa Bay Buccaneers. Rodgers was in a relationship with actress Olivia Munn from 2014 to 2017. In 2018, Rodgers began dating former race-car driver Danica Patrick. In April 2018, Rodgers was announced as a limited partner in the Milwaukee Bucks ownership group, making him the first active NFL player with an ownership stake in an NBA franchise. Since becoming a starter in 2008, Rodgers has become known for his unique touchdown celebration, which he and his teammates have dubbed the "Championship Belt." After a scoring play, Rodgers celebrates by making a motion as if he is putting an invisible championship belt on around his waist. Teammate Greg Jennings said of the celebration: "It's just something fun that he does. We get excited when we see it cause we know that he's made a play or we've made a play as offense." The gesture drew the praise of World Wrestling Entertainment wrestler Triple H and has become common for Green Bay fans to mimic during games. Rodgers's celebration is also featured in a series of State Farm Insurance commercials, renamed the "Discount Double Check". Various teammates, including Raji, Matthews, and Cobb, have joined him in the ads. Rodgers has also been featured in Pizza Hut advertisements, as well as numerous local Wisconsin-based advertisements. In 2015, Rodgers made a cameo appearance (along with Packers teammate Ha Ha Clinton-Dix and fellow NFL players Leger Douzable, D'Brickashaw Ferguson, Tank Carradine, Prince Amukamara, Fozzy Whittaker, Ishmaa'ily Kitchen, and Frostee Rucker) in a segment of the second season of the sketch comedy television series Key & Peele. The segment was the third installment of "East/West College Bowl," a sketch that spoofed player introductions during televised football games. In the sketch, all the players being introduced had unusual names; Rodgers pronounced his own name as "A-A-Ron Rod-Gers" in a callback to a sketch from the show's first season. Rodgers is the founder, and with David Gruber co-creator, of itsAaron[clarification needed] with a mission of "creating awareness for organizations and people who are changing the world". He is also a supporter of the MACC Fund, RAISE Hope for Congo, and other humanitarian and charitable efforts. In a May 12, 2015, episode of Celebrity Jeopardy he raised $50,000 for the MACC Fund by triumphing over astronaut Mark Kelly and Shark Tank panel member and entrepreneur Kevin O'Leary to win the funds. ^ "NFL Yearly Leaders - Passing Touchdown/Interception Ratio". FootballDB.com. Retrieved April 7, 2019. ^ a b "NFL Career Leaders – Passing Touchdown/Interception Ratio". Web. Footballdb.com. Retrieved November 3, 2014. ^ a b "NFL Career Pass Interception % Leaders". Pro-Football-Reference.com. Archived from the original on July 15, 2011. Retrieved September 24, 2015. ^ Mayer, Larry. "Bears gearing up to battle Rodgers". Chicago Bears. Archived from the original on September 25, 2015. Retrieved September 24, 2015. ^ "Where will Rodgers finish among the greatest QBs of all time?" (Television production). nfl.com. August 30, 2018. Retrieved November 13, 2018. ^ "The top 25 NFL quarterbacks of all-time". USA Today. February 28, 2018. Retrieved November 13, 2018. By the time he's done, Rodgers may be No. 1 on this list. At 35, the seven-time Pro Bowler and two-time NFL MVP, who led the Packers to victory in Super Bowl XLV, is still going strong. He holds the NFL record in single-season and career passer rating (122.5, 103.2) and is creeping up on the leaders in nearly every major passing category. ^ a b "Ancestry of Aaron Rodgers". Genealogy.about.com. Retrieved May 10, 2012. ^ a b Jackel, Pete (October 6, 2005). "Focus on Football: Rodgers preparing for his moment". RacineSportsZone.com. JournalTimes.com. Retrieved March 14, 2012. ^ "Green Bay quarterback Aaron Rodgers has strong ties to Beaverton". The Oreganian. The Oregonian. February 5, 2011. Archived from the original on July 15, 2011. Retrieved February 5, 2011. ^ "JC Quarterback Commits to Cal, Butte's Rodgers Could Join the Competition to Replace Boller Next Year". Contra Costa Times. Walnut Creek, California. November 20, 2002. Retrieved May 11, 2012. [He] scored 1310 on the SAT, so Cal's academic reputation was important to him. ^ McGrath, Jim (June 29, 2011). "Green Bay QB Rodgers Visits All-Pro Campers at W&M". Williamsburg Yorktown Daily. Archived from the original on September 21, 2013. Retrieved August 22, 2013. ^ "For Aaron Rodgers, road to the NFL started at an apparent dead end". Washington Post. Retrieved November 30, 2018. ^ Sandler, Michael (August 1, 2011). Aaron Rodgers and the Green Bay Packers: Super Bowl XLV. Bearport Publishing. ISBN 9781617723094. ^ Adams, Bruce (August 3, 2003). "Cal's QB hope: JC transfer Rodgers has what Tedford likes". San Francisco Chronicle. Archived from the original on July 15, 2011. Retrieved January 24, 2011. ^ "Player Bio:Aaron Rodgers". University of California. Archived from the original on July 15, 2011. Retrieved May 13, 2012. ^ "2003 California Golden Bears Schedule and Results". College Football at Sports-Reference.com. Retrieved March 11, 2018. ^ "Cal-USC Postgame Quotes". Cal Athletics. September 27, 2003. Archived from the original on July 17, 2011. After the interception for the touchdown, I went over to him and said 'Do you want to take a couple of series off?' and he said 'Yes.' We put Reggie (Robertson) in and Reggie did a nice job for us." ^ "USC at California Box Score, September 27, 2003". College Football at Sports-Reference.com. Retrieved March 11, 2018. ^ "Insight Bowl – Virginia Tech vs California Box Score, December 26, 2003". College Football at Sports-Reference.com. Retrieved March 11, 2018. ^ Tsuchiya, Anita (July 30, 2012). Aaron Rodgers: Biography of a Super Bowl MVP. Hyperink Inc. ISBN 9781614646129. ^ "2004 California Golden Bears Schedule and Results". College Football at Sports-Reference.com. Retrieved March 11, 2018. ^ "Aaron Rodgers 2004 Game Log". College Football at Sports-Reference.com. Retrieved March 11, 2018. ^ "2004 Pacific-10 Conference Leaders". College Football at Sports-Reference.com. Retrieved March 28, 2018. ^ "Holiday Bowl – Texas Tech vs California Box Score, December 30, 2004". College Football at Sports-Reference.com. Retrieved January 1, 2018. ^ CN&R Staff. "Who to watch in 2005". News Review. Retrieved February 15, 2012. ^ a b "NFL Draft – QB Aaron Rodgers". Draftinsiders.com. Archived from the original on January 11, 2012. Retrieved December 9, 2011. ^ "Memorable Wonderlic Scores". SI.com. February 25, 2013. Archived from the original on April 19, 2018. Retrieved April 20, 2018. ^ "Aaron Rodgers – California, QB : 2005 NFL Draft Scout Player Profile". DraftScout.com. Archived from the original on April 19, 2018. Retrieved April 20, 2018. ^ a b Bensinger, Graham (Host) (December 21, 2016) . In Depth with Graham Bensinger: Aaron Rodgers: Thought I'd be a 49er (Television production, YouTube video). Retrieved December 26, 2016. ^ "2005 NFL Draft Listing". Pro-Football-Reference.com. Retrieved March 11, 2018. ^ Greenberg, Steve (November 20, 2012). "Jeff Tedford developed Aaron Rodgers, but recent QBs struggled". Sporting News. Retrieved March 11, 2018. ^ "2017 Green Bay Packers Statistics & Players". Pro-Football-Reference.com. Retrieved January 1, 2018. ^ Pasquarelli, Len (January 12, 2006). "Packers to hire 49ers' McCarthy as coach". ESPN. Retrieved May 11, 2012. ^ a b Reischel, Rob (2011). Aaron Rodgers. Triumph Books. ^ Pasquarelli, Len (April 29, 2007). "Pats acquire WR Moss from Raiders for draft pick". ESPN.com. Retrieved January 1, 2018. ^ Nickel, Lori (March 9, 2008). "Rodgers preparing to assume control". Journal Sentinel. Archived from the original on October 7, 2008. Retrieved May 12, 2012. ^ "Aaron Rodgers 2008 Game Log". Pro-Football-Reference.com. Retrieved March 11, 2018. ^ "FedEx Air and Ground Week 2 2008 Winners". NFL Network. National Football League. September 20, 2008. Retrieved September 20, 2008. ^ "Buccaneers' defense rattles Rodgers in win over Packers". National Football League. September 29, 2008. Archived from the original on October 1, 2008. Retrieved September 29, 2008. ^ Pelissero, Tom (October 31, 2008). "Packers Sign Rodgers Through 2014". greenbaypressgazette.com. Green Bay Press Gazette. Retrieved October 31, 2008. ^ Silverstein, Tom (November 5, 2008). "Contracts: Rodgers vs. Romo". JSOnline. Milwaukee Journal-Sentinel. Archived from the original on December 5, 2008. Retrieved November 6, 2008. ^ "2008 Green Bay Packers Statistics & Players". Pro-Football-Reference.com. Retrieved March 11, 2018. ^ "NFL Game Center Chicago Bears @ Green Bay Packers". NFL. November 2, 2009. Archived from the original on October 5, 2009. Retrieved November 2, 2009. ^ "Green Bay Packers at Tampa Bay Buccaneers – November 8th, 2009". Pro-Football-Reference.com. Retrieved November 4, 2017. ^ "Aaron Rodgers – Games 9–13 in 2009". Pro-Football-Reference.com. Retrieved March 11, 2018. ^ "Aaron Rodgers 2009 Game Log". Pro-Football-Reference.com. Retrieved January 1, 2018. ^ "2009 Green Bay Packers Statistics & Players". Pro-Football-Reference.com. Retrieved January 1, 2018. ^ "2009 NFL Standings & Team Stats". Pro-Football-Reference.com. Retrieved January 1, 2018. ^ "1996 NFL Standings & Team Stats". Pro-Football-Reference.com. Retrieved January 1, 2018. ^ Huber, Bill (May 9, 2012). "Wisconsin Makes 12–12–12 'Aaron Rodgers Day'". Fox Sports. Archived from the original on July 1, 2013. Retrieved May 13, 2012. ^ "2009, QB rushing leaders". pro-football-reference.com. Sports Reference. Retrieved December 26, 2016. ^ "GB, 1950–2009, highest passer rating". pro-football-reference.com. Sports Reference. Retrieved December 26, 2016. ^ "Green Bay Packers at Arizona Cardinals – January 3rd, 2010". Pro-Football-Reference.com. Retrieved January 1, 2018. ^ "Top Ten Quarterback Duels". NFL.com. Retrieved January 1, 2018. ^ "GB @ AZ play by play". Retrieved December 7, 2016. ^ "2009 NFL Pro Bowlers". Pro-Football-Reference.com. Retrieved March 11, 2018. ^ "NFC Nationals vs. AFC Americans – Box Score – January 31, 2010". www.foxsports.com. Retrieved January 1, 2018. ^ "2010 Green Bay Packers Statistics & Players". Pro-Football-Reference.com. Retrieved March 11, 2018. ^ "Rodgers, 2010, games 1–8". Retrieved December 12, 2016. ^ "Rodgers, 2010, games 9–16". Retrieved December 12, 2016. ^ "San Francisco 49ers at Green Bay Packers – December 5th, 2010". Pro-Football-Reference.com. Retrieved March 28, 2018. ^ "2010 NFL Week 13 Leaders & Scores". Pro-Football-Reference.com. Retrieved March 28, 2018. ^ "Green Bay Packers at Detroit Lions – December 12th, 2010". Pro-Football-Reference.com. Retrieved January 1, 2018. ^ "Green Bay Packers QB Matt Flynn has fine 1st road start". Green Bay Press Gazette. Green Bay Press Gazette. December 19, 2010. Archived from the original on July 16, 2012. Retrieved December 20, 2010. ^ "New York Giants at Green Bay Packers – December 26th, 2010". Pro-Football-Reference.com. Retrieved January 1, 2018. ^ "2010 NFL Week 16 Leaders & Scores". Pro-Football-Reference.com. Retrieved March 28, 2018. ^ Wilde, Jason (January 2, 2011). "Packers 10, Bears 3: Nothing Comes Easy". Channel3000.com. Archived from the original on February 8, 2011. Retrieved January 24, 2011. ^ "Wild Card – Green Bay Packers at Philadelphia Eagles – January 9th, 2011". Pro-Football-Reference.com. Retrieved March 11, 2018. ^ "Green Bay Packers Playoff History". Retrieved December 7, 2016. ^ "Aaron Rodgers". ESPN. Retrieved May 12, 2012. ^ Layden, Tim (February 14, 2011). "Green And Golden: Behind the poise and precision of quarterback Aaron Rodgers and the gutsy contributions of a host of role players, the Packers burnished their championship legacy with a memorable 31—25 victory over Pittsburgh in Super Bowl XLV". Sports Illustrated. Time Inc. Retrieved February 11, 2011. ^ "Aaron Rodgers tosses 3 TD passes as Packers drop Steelers to win Super Bowl XLV". ESPN. Associated Press. February 6, 2011. Archived from the original on February 25, 2011. Retrieved February 7, 2011. ^ "SB, 300+ pass yds, 3+ TD, 0 Int". Retrieved December 7, 2016. ^ "Top postseason passing seasons". Retrieved December 12, 2016. ^ "Playoffs, 900+ pass yds, 2 rush TDs". Retrieved December 12, 2016. ^ "Top 100: Aaron Rodgers". NFL.com. Retrieved March 28, 2018. ^ Burke, Kris (July 2, 2011). "No Workouts? No Problem For The Packers". allgbp.com. Retrieved December 29, 2016. ^ "New Orleans Saints at Green Bay Packers – September 8th, 2011". Pro-Football-Reference.com. Retrieved March 11, 2018. ^ "2011 NFL Week 1 Leaders & Scores". Pro-Football-Reference.com. Retrieved March 28, 2018. ^ Darlington, Jeff. "Drew Brees' absence no big deal, but July 16 deadline looms". NFL.com. Retrieved December 6, 2016. ^ "Denver Broncos at Green Bay Packers – October 2nd, 2011". Pro-Football-Reference.com. Retrieved March 28, 2018. ^ "2011 NFL Week 4 Leaders & Scores". Pro-Football-Reference.com. Retrieved March 28, 2018. ^ "Packers stay perfect at 6–0, beat Rams 24–3". The Salt Lake Tribune. Retrieved December 10, 2018. ^ "Green Bay Packers at San Diego Chargers – November 6th, 2011". Pro-Football-Reference.com. Retrieved March 28, 2018. ^ "2011 NFL Week 9 Leaders & Scores". Pro-Football-Reference.com. Retrieved March 28, 2018. ^ "Green Bay Packers at Kansas City Chiefs – December 18th, 2011". Pro-Football-Reference.com. Retrieved January 1, 2018. ^ "2011 Green Bay Packers Statistics & Players". Pro-Football-Reference.com. Retrieved March 11, 2018. ^ "Aaron Rodgers 2011 Game Log". Pro-Football-Reference.com. Retrieved January 1, 2018. ^ "400 pass yds, 4 TD, 2 rush TD". Retrieved December 6, 2016. ^ "All Time Most Points Scored By An NFL Team In A Season". Sporting Charts. Retrieved December 6, 2016. ^ "Saints' Brees wins AP OFfensive Player of the Year award". NFL.com. Associated Press. Retrieved December 6, 2016. ^ "Divisional Round – New York Giants at Green Bay Packers – January 15th, 2012". Pro-Football-Reference.com. Retrieved January 1, 2018. ^ "As Carolina Panthers prepare for Super Bowl 50, a look at the fates of six previous teams that won at least 15 in regular season". Retrieved December 12, 2016. ^ "2011 NFL All-Pros". Pro-Football-Reference.com. Retrieved March 28, 2018. ^ "2011 NFL Pro Bowlers". Pro-Football-Reference.com. Retrieved March 28, 2018. ^ "'The Top 100: Players of 2012': Aaron Rodgers". NFL.com. Retrieved March 28, 2018. ^ "San Francisco 49ers at Green Bay Packers – September 9th, 2012". Pro-Football-Reference.com. Retrieved January 1, 2018. ^ a b Hanzus, Dan. "Aaron Rodgers' head-scratching bet with Boyz II Men". NFL.com. Retrieved December 6, 2016. ^ "New Orleans Saints at Green Bay Packers – September 30th, 2012". Pro-Football-Reference.com. Retrieved March 28, 2018. ^ "2012 NFL Week 4 Leaders & Scores". Pro-Football-Reference.com. Retrieved March 28, 2018. ^ "Green Bay Packers at Houston Texans – October 14th, 2012". Pro-Football-Reference.com. Retrieved January 1, 2018. ^ "2012 NFL Week 6 Leaders & Scores". Pro-Football-Reference.com. Retrieved March 28, 2018. ^ "2012 Houston Texans, opponent TD log". Pro-Football-Reference. Sports Reference LLC. Retrieved December 31, 2016. ^ "Rodgers, 2012, games 6–10". pro-football-reference.com. Sports Reference. Retrieved December 26, 2016. ^ "Green Bay Packers at Chicago Bears – December 16th, 2012". Pro-Football-Reference.com. Retrieved January 1, 2018. ^ "Green Bay Packers at Minnesota Vikings – December 30th, 2012". Pro-Football-Reference.com. Retrieved January 1, 2018. ^ "2012 NFL Standings & Team Stats". Pro-Football-Reference.com. Retrieved March 11, 2018. ^ "Aaron Rodgers 2012 Game Log". Pro-Football-Reference.com. Retrieved January 1, 2018. ^ "Wild Card – Minnesota Vikings at Green Bay Packers – January 5th, 2013". Pro-Football-Reference.com. Retrieved January 1, 2018. ^ "Divisional Round – Green Bay Packers at San Francisco 49ers – January 12th, 2013". Pro-Football-Reference.com. Retrieved January 1, 2018. ^ "2012 NFL Pro Bowlers". Pro-Football-Reference.com. Retrieved March 28, 2018. ^ "'Top 100 Players of 2013': Aaron Rodgers". NFL.com. Retrieved March 28, 2018. ^ "Find Out Which QB Just Became the Highest Paid Player in NFL History". The Blaze. Retrieved April 26, 2013. ^ "Green Bay Packers at San Francisco 49ers – September 8th, 2013". Pro-Football-Reference.com. Retrieved January 1, 2018. ^ "Washington Redskins at Green Bay Packers – September 15th, 2013". Pro-Football-Reference.com. Retrieved January 1, 2018. ^ "2013 NFL Week 2 Leaders & Scores". Pro-Football-Reference.com. Retrieved March 28, 2018. ^ "480+ yds, 4+ TD, 0 Int". pro-football-reference.com. Retrieved December 25, 2016. ^ "Green Bay Packers at Cincinnati Bengals – September 22nd, 2013". Pro-Football-Reference.com. Retrieved March 11, 2018. ^ "Green Bay Packers at Minnesota Vikings – October 27th, 2013". Pro-Football-Reference.com. Retrieved January 1, 2018. ^ "Aaron Rodgers has fractured collarbone, could miss a month". The Denver Post. Associated Press. November 5, 2013. Retrieved November 6, 2013. ^ "2013 Green Bay Packers Statistics & Players". Pro-Football-Reference.com. Retrieved January 1, 2018. ^ Breech, John (December 26, 2013). "Packers make it official: QB Aaron Rodgers will start vs. Bears". CBS Sports. Retrieved December 27, 2013. ^ "Wild Card – San Francisco 49ers at Green Bay Packers – January 5th, 2014". Pro-Football-Reference.com. Retrieved January 1, 2018. ^ "2013 Green Bay Packers Statistics & Players". Pro-Football-Reference.com. Retrieved March 11, 2018. ^ "'Top 100 Players of 2014': Aaron Rodgers". Green Bay Packers. Retrieved March 28, 2018. ^ "Green Bay Packers at Seattle Seahawks – September 4th, 2014". Pro-Football-Reference.com. Retrieved January 1, 2018. ^ "New York Jets at Green Bay Packers – September 14th, 2014". Pro-Football-Reference.com. Retrieved January 1, 2018. ^ "Green Bay Packers at Detroit Lions – September 21st, 2014". Pro-Football-Reference.com. Retrieved January 1, 2018. ^ Wilde, Jason. "R-E-L-A-X (ESPN Wisconsin)". Archived from the original on December 7, 2014. Retrieved December 7, 2014. ^ "Green Bay Packers at Chicago Bears – September 28th, 2014". Pro-Football-Reference.com. Retrieved March 28, 2018. ^ "2014 NFL Week 4 Leaders & Scores". Pro-Football-Reference.com. Retrieved March 28, 2018. ^ Sherman, Rodger (October 12, 2014). "Packers use fake spike to beat Dolphins". SBNation.com. Retrieved March 7, 2019. ^ a b "2014 GMC Never Say Never Moment". Retrieved December 6, 2016. ^ "Carolina Panthers at Green Bay Packers – October 19th, 2014". Pro-Football-Reference.com. Retrieved March 28, 2018. ^ "2014 NFL Week 7 Leaders & Scores". Pro-Football-Reference.com. Retrieved March 28, 2018. ^ a b "5 things we learned: Packers at Saints". foxsports.com. October 27, 2014. Retrieved January 5, 2017. ^ Armas, Genaro C. (November 10, 2014). "Aaron Rodgers Throws 6 TD Passes In 1st Half As Packers Crush Bears 55–14". The Huffington Post. Retrieved November 27, 2014. ^ a b Neveau, James (November 12, 2014). "Aaron Rodgers Suffered Back Injury vs. Bears". NBC Chicago. Retrieved January 5, 2017. ^ "2014 NFL Week 10 Leaders & Scores". Pro-Football-Reference.com. Retrieved March 28, 2018. ^ "Philadelphia Eagles at Green Bay Packers – November 16th, 2014". Pro-Football-Reference.com. Retrieved January 1, 2018. ^ Imig, Paul (November 30, 2014). "Rodgers outduels Brady for win in first-ever matchup of elite QBs". Retrieved January 1, 2019. ^ "New England Patriots at Green Bay Packers – November 30th, 2014". Pro-Football-Reference.com. Retrieved January 1, 2018. ^ Demovsky, Rob (December 22, 2014). "Aaron Rodgers played with pulled calf". ESPN. Retrieved January 5, 2017. ^ "Detroit Lions at Green Bay Packers – December 28th, 2014". Pro-Football-Reference.com. Retrieved January 1, 2018. ^ "2014 NFL Week 17 Leaders & Scores". Pro-Football-Reference.com. Retrieved March 28, 2018. ^ "2014 NFL Standings & Team Stats". Pro-Football-Reference.com. Retrieved March 11, 2018. ^ "Something has to give: Packers unbeaten at home; Cowboys 8–0 on road". foxsports.com. January 9, 2015. Retrieved December 31, 2016. ^ "Divisional Round – Dallas Cowboys at Green Bay Packers – January 11th, 2015". Pro-Football-Reference.com. Retrieved December 15, 2017. ^ "NFC Championship – Green Bay Packers at Seattle Seahawks – January 18th, 2015". Pro-Football-Reference.com. Retrieved January 1, 2018. ^ Demovsky, Rob. "Aaron Rodgers named NFL MVP". ESPN. Retrieved December 12, 2016. ^ a b "Past NFC Offensive Honorees". 101awards.com. Retrieved December 13, 2016. ^ "2015 'NFL Honors' complete list of winners". NFL.com. Retrieved December 12, 2016. ^ "'Top 100 Players of 2015': No. 2 Aaron Rodgers". NFL.com. Retrieved March 28, 2018. ^ "Aaron Rodgers career statistics". pro-football-reference.com. Retrieved December 13, 2016. ^ Kelly, Danny (November 15, 2015). "Aaron Rodgers and the Packers miss Jordy Nelson more than we thought they would". sbnation.com. Retrieved December 25, 2016. ^ "Packers hope Nelson's return will revitalize offense". foxsports.com. January 19, 2016. Retrieved December 25, 2016. ^ Spofford, Mike (December 30, 2015). "Stats don't matter to Aaron Rodgers". packers.com. Retrieved December 25, 2016. ^ "Kansas City Chiefs at Green Bay Packers – September 28th, 2015". Pro-Football-Reference.com. Retrieved March 28, 2018. ^ "2015 NFL Week 3 Leaders & Scores". Pro-Football-Reference.com. Retrieved March 28, 2018. ^ "Green Bay Packers at Carolina Panthers – November 8th, 2015". Pro-Football-Reference.com. Retrieved January 1, 2018. ^ Rosenthal, Gregg (December 3, 2015). "Packers stun Lions on Aaron Rodgers' Hail Mary TD". NFL.com. Retrieved December 25, 2016. ^ Bennett, Colin (December 9, 2015). "Getaway winner witnesses Motown Miracle". WTMJ. Retrieved March 11, 2018. ^ Aretha, David (July 15, 2017). Aaron Rodgers: Champion Football Star. Enslow Publishing, LLC. ISBN 9780766087170. ^ "2015 Green Bay Packers Statistics & Players". Pro-Football-Reference.com. Retrieved January 1, 2018. ^ "Wild Card – Green Bay Packers at Washington Redskins – January 10th, 2016". Pro-Football-Reference.com. Retrieved March 11, 2018. ^ Wilde, Jason (January 17, 2016). "Jeff Janis forces OT with Hail Mary catch, but celebration short-lived". espn.com. Retrieved December 13, 2016. ^ "2015 NFL Pro Bowlers". Pro-Football-Reference.com. Retrieved March 28, 2018. ^ "'Top 100 Players of 2016': No. 6 Aaron Rodgers". NFL.com. ^ a b Monson, Sam (October 17, 2016). "What's wrong with Aaron Rodgers and the Packers' offense?". profootballfocus.com. Retrieved December 26, 2016. ^ "Aaron Rodgers, 2016, games 1–5". pro-football-reference.com. Retrieved December 26, 2016. ^ Florio, Mike (October 20, 2016). "What's wrong with Aaron Rodgers?". profootballtalk.nbcsports.com. Retrieved December 26, 2016. ^ Gonzalez, Jason (October 17, 2016). "What's wrong with the Packers? All signs point to Aaron Rodgers". startribune.com. StarTribune. Retrieved December 26, 2016. ^ Demovsky, Rob (October 20, 2016). "Experts weigh in on Aaron Rodgers: 'No easy fix'". ESPN. Retrieved December 26, 2016. ^ a b "Aaron Rodgers Career Gamelog". pro-football-reference.com. Archived from the original on December 19, 2011. Retrieved December 25, 2016. ^ Dubin, Jared (October 30, 2016). "Packers vs. Falcons highlights, score: Matt Ryan Aaron Rodgers trade lasers all day". cbssports.com. Retrieved December 25, 2016. ^ Demovsky, Rob (November 23, 2016). "Aaron Rodgers: Packers, at 4–6, can close with 6 straight wins". ESPN. Retrieved January 4, 2017. ^ Demovsky, Rob (January 2, 2016). "Aaron Rodgers's magic carries Packers into playoffs on a run-the-table roll". ESPN. Retrieved January 4, 2017. ^ Sipple, George (January 2, 2017). "Packers QB Aaron Rodgers makes good on 'run the table' prediction". Detroit Free Press. Retrieved January 4, 2017. ^ Gantt, Darin (November 24, 2016). "Aaron Rodgers: "I feel we can run the table"". profootballtalk.nbcsports.com. Retrieved January 4, 2017. ^ a b Silverstein, Tom (November 29, 2016). "Hamstring injury sends Rodgers to tent". Milwaukee Journal Sentinel. Retrieved December 13, 2016. ^ a b Jackson, Zac (November 28, 2016). "Rodgers, defense step up as Packers snap losing streak". Retrieved December 13, 2016. ^ a b c Wesseling, Chris (December 11, 2016). "Aaron Rodgers, Packers dismantle Seahawks". NFL.com. Retrieved December 13, 2016. ^ Pelissero, Tom (December 12, 2016). "After rout of Seattle, Packers re-emerge as team no one wants to see in January". USA TODAY Sports. Retrieved December 13, 2016. ^ a b "Most seasons 35+ pass TD career". pro-football-reference.com. Retrieved December 25, 2016. ^ a b c Demovsky, Rob (December 24, 2016). "Aaron Rodgers for MVP: Packers QB makes case in win over Vikings". ESPN. Retrieved December 25, 2016. ^ "2016 NFL Week 16 Leaders & Scores". Pro-Football-Reference.com. Retrieved March 28, 2018. ^ "2016 NFL Standings & Team Stats". Pro-Football-Reference.com. Retrieved March 11, 2018. ^ "Wild Card – New York Giants at Green Bay Packers – January 8th, 2017". Pro-Football-Reference.com. Retrieved March 11, 2018. ^ "Divisional Round – Green Bay Packers at Dallas Cowboys – January 15th, 2017". Pro-Football-Reference.com. Retrieved March 11, 2018. ^ "NFC Championship – Green Bay Packers at Atlanta Falcons – January 22nd, 2017". Pro-Football-Reference.com. Retrieved January 1, 2018. ^ a b c "Aaron Rodgers: Career Stats at NFL.com". nfl.com. Retrieved January 1, 2019. ^ Borek, Jesse (January 1, 2017). "Packers' Aaron Rodgers leads NFL in TD passes". fanrangsports.com. Nafstrops Media, LLC. Archived from the original on January 4, 2017. Retrieved January 4, 2017. ^ "Most seasons 40+ TD passes". Pro-Football-Reference. Sports Reference LLC. Retrieved January 5, 2017. ^ "2016 QB rushing leaders". Pro-Football-Reference. Sports Reference LLC. Retrieved January 4, 2017. ^ Demovsky, Rob. "Aaron Rodgers has broken collarbone, could miss season". ESPN. Retrieved October 15, 2017. ^ Wesseling, Chris. "Aaron Rodgers suffers broken collarbone vs. Vikings". NFL. Retrieved October 15, 2017. ^ Patra, Kevin. "Aaron Rodgers will have surgery on broken collarbone". NFL. Retrieved October 16, 2017. ^ "Aaron Rodgers has surgery on collarbone". NFL.com. Retrieved October 19, 2017. ^ "Packers place QB Rodgers on injured reserve". Packers.com. October 20, 2017. Archived from the original on October 21, 2017. Retrieved October 20, 2017. ^ Bergman, Jeremy. "Injury roundup: Rodgers has '13 screws' in collarbone". NFL. Retrieved October 26, 2017. ^ Knoblauch, Austin. "Aaron Rodgers focusing on his health, not return date". NFL. Retrieved November 3, 2017. ^ Bergman, Jeremy (December 2, 2017). "Aaron Rodgers returns to Packers practice Saturday". NFL.com. ^ Lewis, Edward (December 12, 2017). "Aaron Rodgers cleared to return, to start vs. Panthers". NFL.com. ^ "Aaron Rodgers activated from injured reserve". Packers.com. December 16, 2017. ^ "Green Bay Packers at Carolina Panthers – December 17th, 2017". Pro-Football-Reference.com. Retrieved January 1, 2018. ^ "Packers place QB Aaron Rodgers on IR". Packers.com. December 19, 2017. Archived from the original on March 26, 2018. ^ Patra, Kevin (December 19, 2017). "Packers place Aaron Rodgers back on injured reserve". NFL.com. ^ Rapoport, Ian. "Aaron Rodgers' collarbone still not completely healed". NFL. Retrieved December 23, 2017. ^ "'Top 100 Players of 2018': Green Bay Packers quarterback Aaron Rodgers". Retrieved October 29, 2018. ^ Siegle, Evan (August 29, 2018). "Packers sign QB Aaron Rodgers to contract extension". www.packers.com. Retrieved August 29, 2018. ^ Teope, Herbie (August 29, 2018). "Aaron Rodgers agrees to 4-year, $134M extension". NFL.com. Retrieved August 29, 2018. ^ Bergman, Jeremy. "Rodgers helps Packers rally against Bears". NFL. Retrieved September 10, 2018. ^ "GAME RECAP: Bills fall on the road in Green Bay". www.buffalobills.com. September 30, 2018. Retrieved December 17, 2018. ^ Owczarski, Jim (October 7, 2018). "Packers doomed by slow start, Mason Crosby's misses in loss to Lions". USA TODAY. Retrieved December 17, 2018. ^ "Bloodied Aaron Rodgers leads Packers and Crosby to redemption over 49ers". The Guardian. October 16, 2018. Retrieved October 29, 2018. ^ Beacham, Greg (October 29, 2018). "Late fumble keeps Rams unbeaten with 29–27 win over Packers". AP News. Retrieved December 17, 2018. ^ "No picks for Packer: Rodgers sets no-INT mark". ESPN.com. December 9, 2018. Retrieved December 10, 2018. ^ Cohen, Jay (December 16, 2018). "Rodgers throws interception as Packers lose 24–17 to Bears". AP News. Retrieved December 17, 2018. ^ "Packers vs. Jets – Game Summary". ESPN. December 23, 2018. Retrieved January 1, 2019. ^ Kruse, Zach (December 24, 2018). "Packers QB Aaron Rodgers matches his own rare feat vs. Jets". Packers Wire. Retrieved January 22, 2019. ^ Demovsky, Rob (December 30, 2018). "Aaron Rodgers suffers concussion in Packers' regular season finale". ESPN. Retrieved January 1, 2019. ^ a b c Jones, Brian (December 31, 2018). "Aaron Rodgers sent to hospital after suffering concussion". 247 SPORTS. Retrieved January 1, 2019. ^ "NFL Single Season Leaders – Passing Touchdown/Interception Ratio". footballdb.com. The Football Database, LLC. Retrieved January 1, 2019. ^ "NFL Pass Interception % Single-Season Leaders". pro-football-reference.com. Retrieved January 1, 2019. ^ "NFL Career Passer Rating Leaders". Pro-Football-Reference.com. Archived from the original on July 15, 2011. Retrieved December 7, 2015. ^ a b "Green Bay Packers:Aaron Rodgers". Web. Green Bay Packers. Retrieved November 3, 2014. ^ "NFL Passer Rating Career Playoffs Leaders". Pro-Football-Reference. Retrieved June 19, 2017. ^ a b "Streak's end shows Aaron Rodgers is 'human'". packersnews.com. Retrieved October 13, 2015. ^ a b "Aaron Rodgers: 1 Regular Season Pick Six". Pro-Football-Reference. Retrieved June 19, 2017. ^ a b "NFL Year-by-Year Playoffs Passing Yards Leaders". Web. Pro-Football-reference. Retrieved November 3, 2014. ^ Demovsky, Rob (October 7, 2014). "Aaron Rodgers sets mark for fewest interceptions at time of 200th TD pass". espn.go.com. Retrieved September 25, 2015. ^ Demovsky, Rob. "Aaron Rodgers reaches 30K passing yards in fewest attempts". ESPN. Retrieved October 19, 2015. ^ "Most touchdown passes of 70+ yards". Pro-Football-Reference.com. Retrieved March 28, 2018. ^ "Most seasons with a passer rating over 100.0". Pro-Football-Reference.com. Retrieved March 28, 2018. ^ "Most seasons with an interception percentage below 1.5%". Pro-Football-Reference.com. Retrieved March 28, 2018. ^ "Quarterbacks to pass for 40 touchdowns in multiple seasons". Pro-Football-Reference.com. Retrieved March 28, 2018. ^ "Highest touchdown passing percentage in the Super Bowl Era". Pro-Football-Reference.com. Retrieved March 28, 2018. ^ "NFL Single-Season Passer Rating Leaders". Retrieved October 12, 2012. ^ "NFL Pass Interception % Single-Season Leaders". Pro-Football-Reference.com. Retrieved March 22, 2019. ^ "Most games with a passer rating over 95.0 in a season". Pro-Football-Reference.com. Retrieved March 28, 2018. ^ "Most games with a passer rating over 100.0 in a season". Pro-Football-Reference.com. Retrieved March 28, 2018. ^ "Most games with a passer rating over 110.0 in a season". Pro-Football-Reference.com. Retrieved March 28, 2018. ^ "Most games with a passer rating over 115.0 in a season". Pro-Football-Reference.com. Retrieved March 28, 2018. ^ "Most games with a passer rating over 130.0 in a season". Pro-Football-Reference.com. Retrieved March 28, 2018. ^ "Most games with a passer rating over 140.0 in a season". Pro-Football-Reference.com. Retrieved March 28, 2018. ^ "Most consecutive games with a passer rating over 95.0 in a season". Pro-Football-Reference.com. Retrieved March 28, 2018. ^ "Most consecutive games with a passer rating over 100.0 in a season". Pro-Football-Reference.com. Retrieved March 28, 2018. ^ "Most consecutive games with a passer rating over 110.0 in a season". Pro-Football-Reference.com. Retrieved March 28, 2018. ^ "Most games with 200+ passing yards and no interceptions in a season". Pro-Football-Reference.com. Retrieved March 28, 2018. ^ "Most games with 2+ touchdown passes and no interceptions in a season". Pro-Football-Reference.com. Retrieved March 28, 2018. ^ "Most games with 3+ touchdown passes and no interceptions in a season". Pro-Football-Reference.com. Retrieved March 28, 2018. ^ "NFL Passing Touchdowns Single-Season Leaders". Pro-Football-Reference.com. Retrieved March 28, 2018. ^ "NFL Passing Yards Single-Season Playoffs Leaders". Pro-Football-Reference.com. Retrieved March 28, 2018. ^ "NFL Passing Touchdowns Single-Season Playoffs Leaders". Pro-Football-Reference.com. Retrieved March 28, 2018. ^ "Lowest Int%, 600+ attempts". www.pro-football-reference.com. Retrieved January 4, 2017. ^ "Lowest Int%, 500+ attempts". www.pro-football-reference.com. Retrieved January 4, 2017. ^ "Highest touchdown pass percentage in a season with at least 450 pass attempts". Pro-Football-Reference.com. Retrieved March 28, 2018. ^ "Highest yards per attempt average in a season with at least 500 pass attempts". Pro-Football-Reference.com. Retrieved March 28, 2018. ^ Gardner, Sam (November 9, 2014). "Aaron Rodgers' six first-half TD passes match NFL record". FOX Sports. Retrieved March 28, 2018. ^ "Players to pass for over 400 yards while throwing four touchdown passes and running for two in one game". Pro-Football-Reference.com. Retrieved March 28, 2018. ^ "Consecutive playoff games with at least three touchdown passes". Pro-Football-Reference.com. Retrieved March 28, 2018. ^ "Quarterbacks to pass for over 300 yards, with 3 touchdown passes and no interceptions in a Super Bowl". Pro-Football-Reference.com. Retrieved March 28, 2018. ^ "Highest passer rating at home in a season". Pro-Football-Reference.com. Retrieved March 28, 2018. ^ "Consecutive games with at least 3 touchdown passes and no interceptions". Pro-Football-Reference.com. Retrieved March 28, 2018. ^ "Highest completion percentage in a playoff game with a minimum of 35 pass attempts". Pro-Football-Reference.com. Retrieved March 28, 2018. ^ "Arrington, Rodgers and Riddle Named Team MVPs" (Press release). December 13, 2004. Archived from the original on June 9, 2012. ^ Wilde, Jason. "Rodgers-to-Cobb named Never Say Never play of the year". ESPNWisconsin.com. Archived from the original on February 8, 2014. Retrieved February 2, 2014. ^ Kasprzak, M. J. "Aaron Rodgers Earns 2010 FedEx Air Player of the Year". Bleacher Report. Retrieved January 22, 2019. ^ Peterson, Eric (May 9, 2012). "12–12–12 proclaimed Aaron Rodgers Day". Fox11. Archived from the original on May 18, 2012. Retrieved May 19, 2012. ^ "Aaron Rodgers' House in Saumico, Wisconsin". Virtual Globe Trotting. Retrieved December 25, 2016. ^ Paris, Jay (November 2, 2012). "Super Bowl MVP Aaron Rodgers Calls San Diego Home". North County Times. Archived from the original on May 10, 2012. Retrieved May 14, 2012. ^ Kimes, Mina (August 30, 2017). "The Search For Aaron Rodgers". ESPN The Magazine. ^ "Jordan Rodgers Vanderbilt Bio". VUCommodores.com. CBS Interactive. Retrieved June 19, 2017. ^ Imig, Paul (April 27, 2013). "Rodgers' younger brother Jordan signs with Jacksonville". FoxSports.com. Fox Sports Interactive Media. Retrieved June 19, 2017. ^ "Jordan Rodgers Remembers His 'Good Little' Football Career". ThePostGame.com. Retrieved March 7, 2019. ^ "Aaron Rodgers, unmasked". ESPN.com. Retrieved March 7, 2019. ^ Mizoguchi, Karen (April 7, 2017). "Olivia Munn and Aaron Rodgers Break Up". People. Retrieved April 7, 2017. ^ Martinelli, Michelle R. (February 17, 2018). "Danica Patrick shares beach photo with Aaron Rodgers and her family". USA Today. Retrieved February 18, 2018. ^ "Danica Patrick finds love away from track with Aaron Rodgers". Associated Press. January 15, 2018. Retrieved February 18, 2018. ^ Demovsky, Rob (April 20, 2018). "Aaron Rodgers buys minority stake in Bucks: 'A dream come true'". ESPN. Retrieved April 22, 2018. ^ Zillgitt, Jeff (April 20, 2018). "Aaron Rodgers joins Milwaukee Bucks ownership group; Packers icon frequently attends games". USA Today. Retrieved April 22, 2018. ^ "Photos: Aaron Rodgers and Danica Patrick at Bucks-Celtics, Game 3". Milwaukee Journal Sentinel. April 20, 2018. Retrieved April 22, 2018. ^ Bergman, Jeremy. "Aaron Rodgers named minority owner of NBA's Bucks". NFL. Retrieved April 21, 2018. ^ "The Evolution Of Aaron Rodgers' Weird "Belt Dance" | Real Fantasy". Realfantasy.sportspagenetwork.com. Archived from the original on April 16, 2012. Retrieved May 10, 2012. ^ "Aaron Rodgers | Championship Belt Celebration". SportsGrid. January 16, 2011. Retrieved May 10, 2012. ^ a b "Aaron Rodgers Championship Belt Special on ESPN". ESPN Channel on YouTube. January 25, 2011. Retrieved May 10, 2012. ^ "State Farm® – State Of Imitation (Aaron Rodgers)". State Farm® Channel on YouTube. Retrieved May 10, 2012. ^ "State Farm® – State Of Imitation 2 (Raji)". State Farm® Channel on YouTube. January 6, 2012. Retrieved May 10, 2012. ^ Rovell, Darren (September 4, 2012). "Pizza Hut uses Aaron Rodgers in new ads". ESPN. Retrieved December 29, 2016. ^ Kirchen, Rich (August 20, 2015). "Aaron Rodgers' commercial work in Wisconsin appears to be dwindling". Milwakee Business Journal. American City Business Journals. Retrieved December 29, 2016. ^ "Gruber Law Brings Awareness Through "Its Aaron" with Aaron Rodgers". Gruber Law Offices. Retrieved March 7, 2019. ^ Nickel, Lori (May 14, 2013). "Aaron Rodgers Shines at MACC Fund Event". Milwaukee Journal Sentinel. Retrieved February 2, 2014. ^ Demovsky, Rob. "Aaron Rodgers address 'crazy rumors'". ESPNWisconsin.com. Retrieved February 2, 2014. ^ Garber, Greg (January 1, 2014). "Aaron Rodgers makes real difference:Packers quarterback uses his clout to bring awareness to Raise Hope For Congo". ESPN.com. Retrieved February 2, 2014. Wikimedia Commons has media related to Aaron Rodgers.